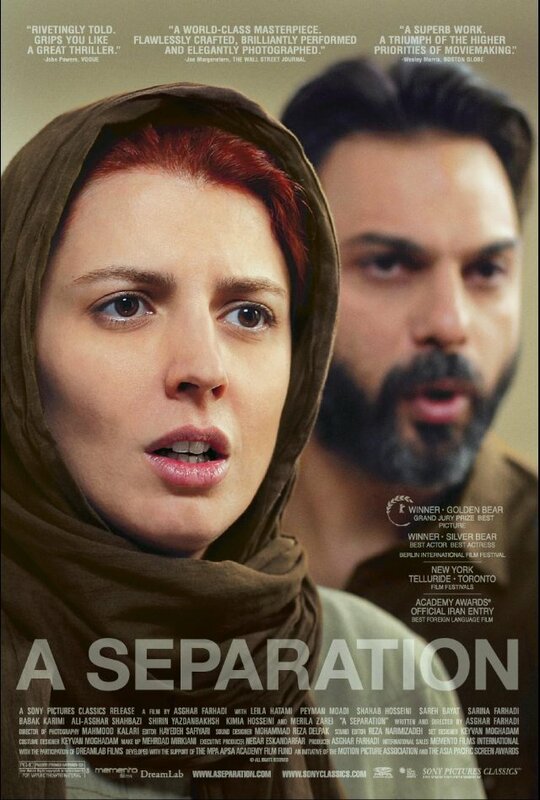 Asghar Farhadi’s “A Separation” begins with husband and wife Nader (Peyman Moadi) and Simin (Leila Hatami) sitting side by side, facing us, explaining their problem to an unseen adjudicator. They had planned to emigrate, for a better life for their daughter, she says. They finally have visas to leave, and 40 days left to use them. But Nader’s father has Alzheimer’s: how can he leave his father, he asks? His father no longer recognizes him, Simi says. But he recognizes his father, Nader says. And so on. Simin has petitioned for divorce, threatening to leave without him. It is too reasonable and too difficult. The camera sits unmoving, pinning us in the adjudicator’s chair as Simin pleads and Nader rebuts, but how could we possibly decide? There can be no victory for anyone. Both positions are reasonable. Thus the separation happens. Simin leaves the family home, laboring her exit but in vain: Nader does not try to stop her. In Simin’s absence, Nader hires Razieh (Sareh Bayat) to care for his father during the day. This sets off a situation that mirrors the reasonableness and difficulty of the original dilemma, but this one more complex and urgent. Again we are put in the impossible position of trying to adjudicate. Razieh, pregnant and with her daughter in tow, comes to work. The commute is long and the job is difficult, and, worse, Razieh is concealing from her unemployed husband Hodjat (Shahab Hosseini) that she is working at all. She is conscientious but suffering, having spells of dizziness and fatigue. Nader he comes home early one day to find Razieh and her daughter gone, the door locked, and his father tied to the bed and unconscious. Money is missing too; we know that there is an innocent explanation for this but Nader does not. He is angry. When Razieh returns, he orders her out of the house, but she comes back to protest her innocence of the theft. When Nader throws her out a second time, he seems to push her out the door. Neighbors find her injured in the stairway. Later, in hospital, we lean that she has miscarried. Nader is accused of manslaughter. Did he know that Razieh was pregnant? If so, the judge decides, he can reasonably be punished for killing the child. The decision will hinge on this piece of information, but while the court goes about trying to learn it, we are tormented by watching all of the players laid out on the rack of a brutal situation that is immensely more complicated than any legal decision could ever allow. “A Separation” isn’t a many-perspectives movie, but it pulls off with astonishing success the trick that that genre most covets, the harnessing of sympathy for each character very nearly always, even when they are in direct opposition. The predicament is finely poised, the actions of all the players terribly understandable, and a successful resolution for everyone utterly impossible. I found it almost overwhelming. Where a movie like “Crash” (2004) attempts the same by having heroes and villains exchange places from moment to moment, “A Separation” needs no heroes or villains. The shifts, such as they are, are in emotional perspective and they’re impeccably subtle. I can’t think of another movie that performs this magic so well. The tiny crack in the armor is Nader’s passivity. Throughout he asks others to judge and decide for him. Simin can leave if she wants, he says. If his daughter Termeh thinks him guilty she should do one thing, and if not another. This equivocating could endanger the plot’s perfect conceit by making it seem merely unsolved rather than insoluble: it almost seemed as if things could be OK if only Nader could decide something for himself. But Nader, being at the center of things, is in the end the most like us, skewered on a Morton’s fork of impossible choices. It’s hard to blame Nader for his passivity when it is so difficult for us as mere observers to decide what is right. And always there is Nader’s father. It is hard to say whether he is only an excuse for Nader to avoid emigrating with his family, despite his obvious devotion, but in this desperate movie he is indispensable, the one immovable object in the fluid tragedy. Without him the conflicts would be petty; he is an anchor to the tragedy, the more so that his disease has him a shadow of whatever he once was. After the separation he whispers Simin’s name, questioning as best he can, to Nader. After the day of Razieh’s tragedy he falls silent entirely. Simin is not there anymore. She is often absent for us, too, as Farhadi keeps her offscreen for long chunks in which the worst of the tragedy is happening. We don’t see what she is up to in the meantime. Neither does she see the nuance of the situation when returns, because she is the active force, seeking solutions. Watching her actions when she is pulled back in, it is difficult to imagine that the decision to emigrate was not hers alone. In the separation there has been nothing but catastrophe. Simin and Nader’s original dilemma, then, has been horribly amplified: if only they had been together, these things would never had happened. Should Simin never have left, forgoing her dream of a better life for them all? Should Nader have agreed to go, leaving his father and the world he knows? We arrive back where we started. In a perfect final scene it is Termeh who is being hounded to decide between her parents. Repeatedly she is asked: have you decided? How can she make such a decision?